It’s a well-known Biblical account. Three men refused to worship the evil king’s golden idol so the king threw them into a blazing furnace. The furnace was so hot that it killed the solders who got close enough to throw the men in. 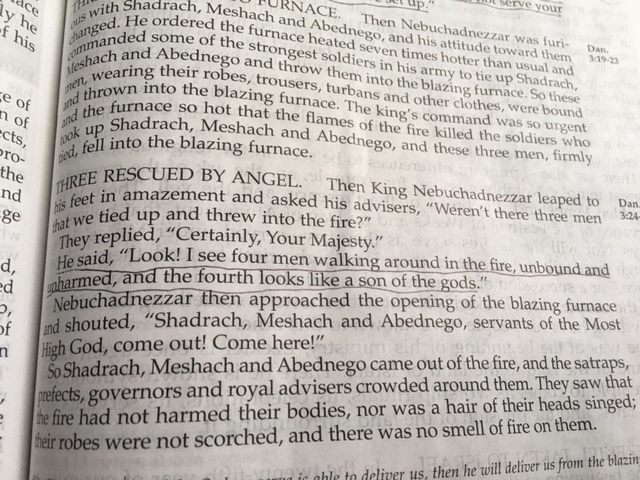 The king looked into the furnace and saw 4 men walking around in the fire, unbound and unharmed. 4 men – not 3. The king called the 4th person an angel. I’ve heard others say it was Jesus. Whoever it was, he was sent by God to protect Shadrach, Meshach and Abednego in a personal way – they walked in the fire together. There wasn’t a long magic wand waved in heaven. The furnace didn’t break when they were thrown it. The fire didn’t turn to ice. God had an unimaginable number of ways he could have saved these 3 men. And he chose to send his rescuer personally into the fire with them. To walk with them- just like he walks with us when we are in the middle of a fire in our lives. Our fires can look like failure…. Our God walks in the fire with us – protecting us and guiding us. We often don’t get right out of the fire. We end up living in it and walking around in it for awhile. When we remain faithful in the fire, God uses this time to grow our character, grow our perseverance and grow our faith. In our lives, God doesn’t always take the fire away – but he gives us peace in the fire. And he gives us opportunities to share with others what we are learning about God’s faithfulness as we walk together in the fire. Great is your faithfulness, oh God, my Father. BiblefaithGod walks with us through our firesGod's Wordits a journeythen there were 4.